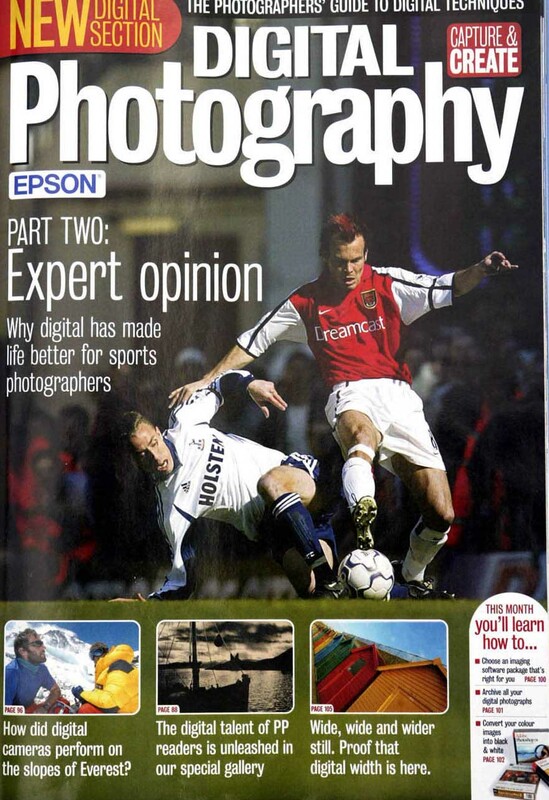 PP: Press and sports photographers were apparently some of the very first professional digital photographers, were you keen to change right from the start or did it take some persuasion for you to jump from a film format? PB: The change was rather forced upon me, as the agency I was working for at the time were an early adopter of digital technology with the Canon/Kodak DCS3, (a brick of a camera with no preview screen) whilst initially reluctant by the time the DCS520 became available I was a digital convert, and according to some even a little evangelical about digital. PP: Much like a wildlife photographer, being on location and present at news and sports events, these are likely to be one off occasions and you canâ€™t control the weather, has being digital made this easier for you to get great pictures (e.g. getting correct exposure) and if so how exactly? PB: Not significantly, were it has made a big difference on getting the exposure right is when doing car shots, the ability to preview test images takes a lot of the guess-work out of the situations, which means that even I can manage to get decent car shots. PP: What gear do you use and why did you decide upon that particular system, was speed your most important consideration both in terms of the camera and downloading to your clients? PP: Often with media and sports events you are looking for just one expression or crucial moment e.g. 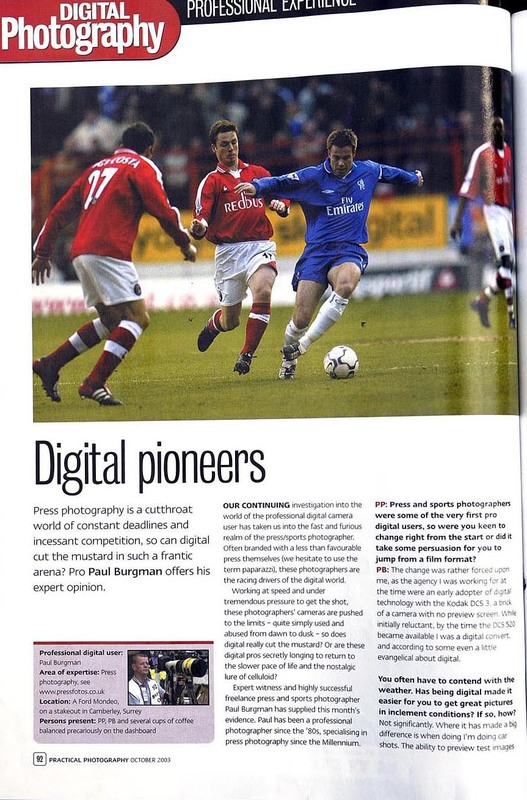 the winning goal, does digital have any major significant advantages for getting these “golden shots” over film cameras? What do you find the most useful feature/function of your digital camera and how do you use it “on the pitch”? PB: One of the biggest advantages is the ability to review the images so quickly after capture, it means that you can leave job knowing that the picture is in the bag, and it means that re-shoots are (or should be) a thing of the past. Even with film, you’d have a good idea of what you got, but until the film came out of the tank you could never be certain, and off course film processing in the boot of the car is was a real pain. PP: How has turning digital affected the way in which you work and do you think that the quality of your images has declined as a result of this change? PB: I don’t think that the image quality (in terms of content) has declined, however in the future there we may look back and see that there are less images kept, with film you generally archived everything, where as on digital you tend to delete the least successful images. In my experience, there have been occassions when jobs shot on film have been re-examined later in a different context that they suddenly become more valuable. For example many images of Paul Burrell in the background of a picture of Diana (PoW) may have been deleted if shot on digital, whereas on film they tend to be kept for ever and who would have guessed 6 years ago that an image of him would ever be of interest, except in an obituary. The other big change is that photographers are doing more of the picture editors work, whereas a few years ago at a football match you would shoot the first half of the match and hand your films to a despatch rider. The captioning and editing would all be done by the picture desk, whereas all images now have to be captioned before sending. PP: In addition to using the digital camera, what is the process of getting your images to your clients in the cutthroat media world? PB: The technology that is used in the field is really relatively simple, a lap-top and a mobile phone, and the images are generally sent direct to land telephone line with a Mac and a modem at the other end. We have recently changed the way that we work, in order to compete with the bigger agencies, and have developed our own e-business solution, which enables us to wire images (via FTP, using either GSM or GPRS web access) to our website and email them from the web-host. Most snappers in the field tend to use Apple Mac laptops and Nokia mobile phones on the Orange network as Orange are the only UK provider to give Highs Speed Data (28.8k) rather than 9.6k or 14.4k on other networks. PP: Many people worry about accidentally deleting images with digital systems, have you ever lost any images to cyberspace when downloading them in the heat of the moment? PB: I have never deleted an image, yet! I have had equipment fail, and lost an entire photo-shoot, this was using the old Viper PCMCIA cards in a Kodak DCS520. The Vipers were a predecessor to the Microdrives, but incredible fragile, since moving to Compact Flash cards with the Canon EOS1d I have never (touch wood) had a card fail, despite being used and abused. PP: How does your digital gear cope with being on the road? Do you experience any troubles with rain, dust and lack of battery power that we often hear about in the photographic press? PB: I too have heard of trouble with digital equipment, but not generally from press photographers, our equipment works hard but as our livelihood depends upon it, we tend to look after it, My EOS1ds have been out all day in the pouring rain, I have changed lenses whilst on a beach, and to date have never had an equipment failure (I bought my first 1d in January 2002). Battery power is a different story the 1d is power hungry and the batteries supplied seem to variable I have 2 that’ll last for ages and two that give up the ghost after a couple of hours. PP: You must have been present at some fascinating times in recent history but what is your most lucrative shot to date and was it digital? If not then would it have been easier with a digital camera and how? PB: Difficult to say what my most lucrative shot was as for much of my professional career I worked for Press Agencies and as result had very little idea of what my images earning for the agency, but probably one of my most published images was of Chris Evans on the day that he was sacked from Virgin Radio, which made t he front page of the Sun and page 3 in The Mirror and had many other sales since and even lead to a TV appearance on BBC 2s my Worst Week. It was shot on digital and as it was a Car Shot of him through the front windscreen, it was made a lot easier being shot on digital as I was able to set up for a car-shot by practising on a nearby parked car.